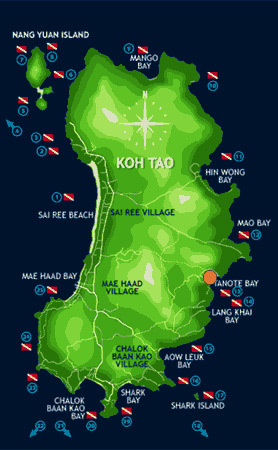 Tanote Bay is a beautiful, secluded, pristine white sand beach, nestled between the rugged headlands of the east coast of Koh Tao. The bay is famous for it's excellent snorkelling and scuba diving where vibrant coral reefs dot the clear blue shores of Montalay Beach Resort. The beach is one of the best seashores on the island, with beautiful views of nearby Shark Island, Koh Phangan and tourist attractions close to the resort. Ideal for families with children as it is a very safe beach for them to play on and explore. Guests can choose to relax by the seaside fresh water pool or on Koh Tao’s finest beach where they can take a swim and immerse themselves in the serenity and seclusion of Tanote Bay. The Montalay Beach Resort’s Water-sports Centre provides guests with excellent snorkelling and scuba diving opportunities in the bay and nearby sites. The Montalay Beach Resort offers fine dining, a beach bar, a spa and massage facilities ensuring your stay is both enjoyable and relaxing. Transfer from Koh Tao pier is provided for guests of the Montalay Beach Resort.